Knickernappies Holiday Gift Guide *Final Day*, Green Gifts & Giveaways Galore! Today is the final day of our Holiday Gift Guide and Giveaways! Thanks so much for all your daily participation and for all our generous sponsors who donated such great Gift Certificates. Happy Holidays from Knickernappies! Teething Bling Pendants and Bangles from My Sweet Pickles! "Teething Blingwas inspired by babies who like to tug on our jewelry. It is the original patent-pending teething jewelry. We use only the highest-quality, phthalate-free, federally approved silicone in our Teething Bling line. The material is non-toxic, latex-free, food–safe, even dishwasher-friendly! It is the same silicone used in many other popular teething products and SGS test reports are available upon request. Although we stress that this is adult jewelry not intended for children to wear, all of our pendants come with a breakaway clasp as an added safety feature." Teething Bling would make a perfect, affordable and unique gift for any new or expecting mom! Check out My Sweet Pickles today! The Eco Tub, Spa Baby Tub from Growing Up Green in Canada! There is no other 100% recycled plastic bath tub on the market (that I know of) and it's a huge seller for us. It is completely free of BPA, PVC, Phthalates and Latex. One of the other differences between the Eco Tub and other tubs, is that it comes with a "No slip" bath mat, to keep baby from sliding on the bottom of the tub. It is a European design, "bucket" type bath tub. Growing Up Green's has expanded and their website is currently under construction. For all inquiries regarding their products and how you can order please either call them or contact them by email or through FaceBook! Make sure you become their Fan and you'll be notified as soon as their website is back up and running! 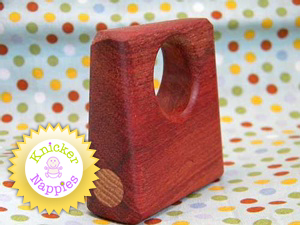 One of a kind Wooden Teething Rattles from Cloth Diaper Outlet! "Our rattles are made from many types of non-toxic domestic and exotic woods. We generally use a different type of wood for the plug on the side for a unique look, but custom orders can be made with all one type of wood. We use Osage Orange, Maple, Walnut, Bloodwood and Cherry. Each rattle is filled with copper .177" ball barrings for a soothing sound for you and the baby who receives it. A small amount of wood glue is used which is FDA approved for indirect food contact and is also water-resistance. Though they share a similar look, no two rattles are exactly alike." These unique wooden, non-toxic teething rattles are the perfect gift for those eco-conscious parents on your shopping list. These rattles provide tons of fun and can be kept as a keepsake for future generations. Become a Fan of Cloth Diaper Outlet and you'll get first hand updates, sales announcements, exlcusive discount codes and more! Today's Prize: One winner will be chosen to receive a $20.00 Gift Certificate to Cloth Diaper Outlet or a $25.00 Gift Certificate to Growing Up Green! (1 entry) Become a Fan of Cloth Diaper Outlet on FaceBook and comment on their wall to say hello and verify that you indeed became or already are a Fan. (1 entry)Visit Cloth Diaper Outlet and comment here with one other item you'd think you might like to purchase from them besides the featured Gift Guide item. (1 entry) Become a Fan of Growing Up Green on FaceBook and comment on their wall to say hello and verify that you indeed became or already are a Fan. (1 entry)Visit Growing Up Green and comment here with one other item you'd think you might like to purchase from them besides the featured Gift Guide item. Please keep in mind that their site is currently under construction. Please contact them via phone or email if you have any questions. Thanks! *Reminder, you have until 12pm EST on Dec 23rd to enter this giveaway and then 48 hours to claim your prize if you do win. Today is the final day of our Gift Guide and Giveaways! Good Luck! Cloth Diaper Outlet fb fan! I would buy a FuzziBunz hemp one size diaper from Cloth Diaper Outlet! New fan of Growing up Green on fb! I like the Raz-paks and baby cubes from Growing up Green! cloth diaper outlet - I would get a thirsties duo wrap in meadow. Already a fan of Knickernappies on fb! I am a Fan of Knickernappies on FaceBook. I'm a fan of CDO on FB. From CDO, I would buy a GroVia AIO in one of their new prints - either the owls or the black birds. I can't decide which one I like better! I'm a FB fan of Growing Up Green and I commented on their page. From Growing Up Green, I'd get a medela nursing bra. I'm a fan of KN on FB. Visited Growing Up Green. I would purchase an Easy-Clean one size pocket diaper in Mango! Since posting on FB is 3 entries, I'm going to put three comments... I hope that's how I'm supposed to do it. Entry 1 - I posted on FB about this giveaway and tagged Knickernappies. Entry 2 - I posted on FB about this giveaway and tagged Knickernappies. Entry 3 - I posted on FB about this giveaway and tagged Knickernappies. I would like to get a Medela nursing bra from Growing Up Green. I would also like some bumgenius diapers from Growing up Green! I would also like the Chines DSQ prefolds from Cloth Diaper Outlet. I'm a fan of Cloth Diaper Outlet on Facebook. I'd order another Planet Wise pail liner from Cloth Diaper Outlet. I'd like the Mommy's Touch changing pad from Growing Up Green. I visited CDO and would like a wet/dry bag from Planet Wise! I also like the unbleached prefolds on growing up green. Visited Growing Up Green and I would love to try a Baby Kanga diaper! I am a facebook fan of Cloth Diaper Outlet and left a comment. There are several items I would like to try from Cloth Diaper Outlet...would like to try the Thirsties Duo Diaper. I would love a Green Acres Designs Diaper from Growing Up Green. From Growing up Green I would want a Dry Bees Pocket Diaper. From the Cloth Diaper Outlet I would like Teething Bling Necklace. New CD Outlet FB fan and left KN love. I'd like to purchase baby bear dryer balls from CD outlet. New Growing Up Green FB fan and left KN love. From Growing Up Green I might like some Unbleached Prefolds. I'm already a KN FB fan. I follow KN blog (JLJMommy). from growing up green I'd like to buy one of their cloth diapers. I would have to do a little more research before choosing a brand! Fan of the Cloth Diaper Outlet on FB. I'd like to try the Econobum OS Diaper System from The Cloth Diaper Outlet. Fan of Growing Up Green on FB. I;d like to try the Baby Kanga One-Size pocket diaper from Growing Up Green. Fan of Knickernappies on FB. I am a fan of growing up green on fb. I would like to buy a fuzzibunz OS diaper from cloth diaper outlet. I am a knickernappies fb fan! New fan of growing up green! New fan of cdo on fb! I am a FB fan of cloth diaper outlet. I am a fb fan of growing up green. I would LOVE, LOVE, LOVE a bumgenius 3.0 from growing up green! I'd get a bumGenius Elemental diaper from Cloth Diaper Outlet. The one-size hemp inserts from Growing Up Green look great! I am a fb fan of knickernappies! I am a fan of the cloth diaper outlet on fb! I fanned growning up green and thanked them! I am a Knickernappies Facebook fan! i really like the wubbanub pacifiers from the cloth diaper outlet! I like the snack trap from growing up green! like Cloth Diaper Outlet on fb. on fb & left a message. I like the Breast Pads @ growing up green. I follow Knickernappies blog via gfc. Shared today's giveaway on FaceBook. I would probably buy a bG 4.0 in one of their bright colors from The Cloth Diaper outlet. I would get some newborn sized prefolds from Growing up Green! FB fan of Cloth Diaper Outlet and left comment. FB fan of Growing up Green and left comment. I'm already a fan of CDO on FB! I'd like to try a Rump•a•rooz® One Size Snap Cloth Diaper in Root Beer from CDO! I 'liked" Growing Up Green of FB! I'd like to try Mommy's Touch Mama Pads from Growing Up Green! I follow the Knickernappies Blog on GFC! Became a fan of CDO on FB and wrote on their wall. Thanks for writing about this. This too can be very helpful for fans of our blog. If you want your readers to win more contests while helping the environment, then this video that I saw on YouTube might interest them: http://www.youtube.com/watch?v=0EPYzxXrcLg. I'd like to try t he Grovia or Thirsties cloth wipes! from G^G's website, I'd love to try the Baby Kanga diapers!